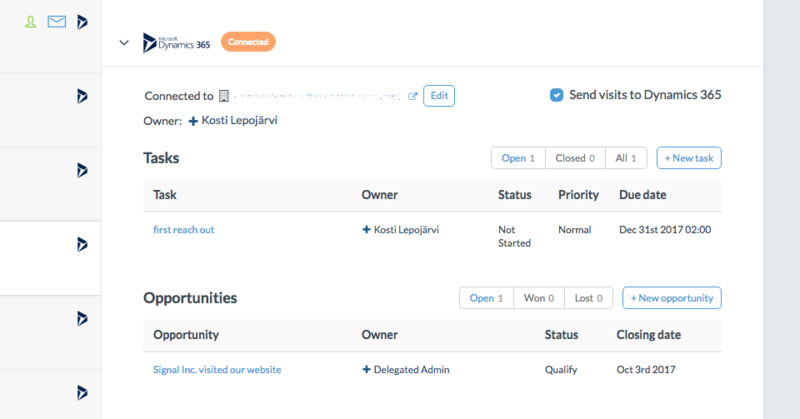 STEP 1: Take an interesting lead from Leadfeeder to Dynamics by clicking on Connect as. NOTE: We connect the no-brainers for you, so you don’t need to connect every lead manually. So once you've integrated Dynamics, you will start seeing these “Dynamics 365” badges next to the Leadfeeder leads. STEP 2: After connecting a lead with Dynamics, visits will appear at Dynamics's end like in the screenshot below. STEP 3: By clicking the arrow in the top navigation bar and choosing Page Views more details will open up. STEP 4: Also, when the Leadfeeder lead is connected to Dynamics account or lead, you’ll immediately see what tasks you’ve already scheduled for the account or lead. Moreover, you can create new tasks without leaving the Leadfeeder interface.